April 6, 2014… Deacon Mike – How Ready Are We? Dec. 31, 2013, Mary, Mother of God…Fr. Chris – Simplicity is the key. 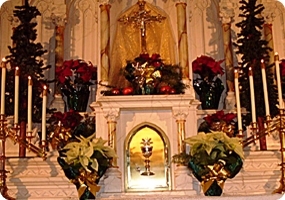 Christmas Midnight Mass 2013…Fr. Chris – That which is holy becomes common, so that that which is common can become holy. Nov. 16, 2013…Fr. Chris – How Are We Doing? Nov. 3, 2013…Fr. Chris – Look at Jesus. Let Him look at you. August 25, 2013…Father Chris – Who will be saved?